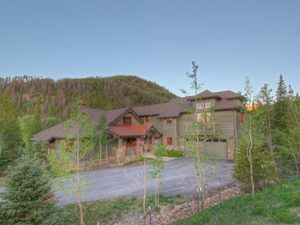 The Highlands at Breck – Gold Run is one of the filings of the Highlands at Breckenridge in Breckenbreridge Real Estate. All the houses and vacant lots of Highlands at Breck – Gold Run are located on Glen Eagle Loop, Gold Run Road or Fairways Drive. There are a total of 26 lots, 3 are dedicated open space, 13 of the lots have homes on them while 10 are vacant parcels of land in Breckenridge Colorado. One of the features of the lots in the Highlands at Breck – Gold Run is the spectacular mountain views of the Ten Mile Range. Many of the properties located within the Highlands at Breck – Gold Run filing are adjacent to holes 6, 7 and 8 of the Beaver course at the Breckenridge Golf Club in the summer. In the winter the Breckenridge Golf Club becomes the Gold Run Nordic Center where you can cross country ski or snowshoe on designated trails, enjoy a sleigh ride or go ice skating on the local pond. Looking for a luxury home for sale in Breckenridge CO Real Estate don’t miss seeing the spectacular homes available in The Highlands at Breck – Gold Run. Looking for a home elsewhere in Summit County Real Estate, we can assist you with that as well. Contact Justin and Krystal Knott with LIV Sotheby’s International Realty to discuss your individual search today.